Well that was the very first post on Plymothian Transit way back on the 31st March 2005 which with my analysts hat on, I can tell you was 7 years ago today. yep, SEVEN YEARS! I gave up the idea of trying to post every day a long time ago. I think I am probably on about 5 a week which seems to be manageable and keeps things moving along nicely. We do have a thriving bus enthusiast scene here in Plymouth which has certainly helped keep the blog going for all of this time. There have been many times when I didnt have anything to post myself that someone else has come up trumps and sent me something, or made a suggestion. The use of Flickr has also grown over the years which has given access to an amazing treasure trove of photos, the owners of which have nearly always been happy for me to use on the blog. Like many others I was with Fotopic before but I jumped ship quite early, well before they hit problems taking all their members photos with them. Flickr has so many options to make sharing photos easier that its an essential blogging tool! The other thing which has helped this blog so much over the years is the involvement of quite a few people within the industry. Senior staff within both Citybus and First have popped in occasionally and either sent photos or given me information or just answered questions I posted. 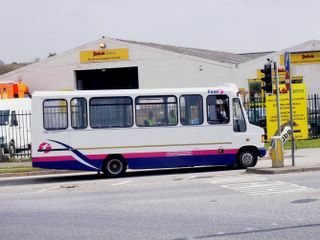 (Special thanks to my friend Brian George at Citybus who has supplied many photos over the years with permission from the company). One of the biggest changes I have seen has been in the number of other bus blogs which have sprung up (and have actually lasted!). The excellent Omnibuses Blog is slightly older than me with a few occasional postings from back in 2004 but it was the end of August 2005 when he started posting daily. This is still required viewing and still pretty much every day – dont know how he does it! I now have quite a few on my daily lists, most of which appear below my blog posts. This is a totally manual process and all done in html the old fashioned way so occasionally I get behind but hopefully its still worth it. I know I have helped many people discover new blogs which has helped the new blogs get new readers. If you know people are reading your blog and let you know, it does make it easier to post. Thanks again to all who have contributed over the seven years, and to those who have just popped along and read a few postings. This time last year I was running at aprox 6000 views a month. My views for March 2012 have just gone over the 10,000 views for the first time. Wow! Plymouth Hoe 10am – the launch of the new Volvo Wright buses for Plymouth Citybus. Once the official launch and pictures are taken then the buses will be rolled out onto our service 43, enabling enthusiasts to get pictures of at least seven of the ten in service on the same day. I will be happy to give enthusiasts a ride around the City on one of the buses before it enters service. Sadly I am still officially off sick so I wont be there (gutted!) but I will be bringing you pictures later. Enjoy yourselves!! Thanks for an enjoyable seven years of blogging - I can't believe its been that long! Here's to many more excellent posts to come. Congratulations Graham and many happy returns. My own blog may have posts dated before yours but my early efforts were somewhat half-hearted. As I've said here it was Plymothian Transit that was an early inspiration for Omnibuses and yours started me thinking that there might be a niche for a bus blog. I wonder how many blogs between us we've also inspired. When we started, there were few of them. Now, there seem hundreds. I think you and I were actually quite pioneering. Oh god, I actually remember that first post. I'm just going to sit in the corner now and slowly rock back and forth, wondering how time has flown so quickly.. Anyway, well done Graham for this quite amazing achievement. I would wholeheartedly like to wish you many more years of transport related nerdery! P.S. I also vaguely remember a blog you had before this one, but can't remember what it was called..
Makes my two years (plus) seem fairly feeble! But my 500th coming up.